Figure 1. Increased splitting number and transmission distance in optical access system using this technology. Tokyo and Kawasaki, Japan, October 13, 2011 — Fujitsu Limited and Fujitsu Laboratories Limited today announced the development of optical amplifier technology for use in optical access systems that link subscribers to central offices. The new optical amplifier technology has the ability to quadruple the splitting number and double transmission distance. The use of optical aggregation networks, in which optical signals between a central office and many subscribers are optically passed along, rather than converted into electrical signals, has been proposed as one way to reduce the constantly growing amount of electrical power consumed by networking equipments. Although passive optical networks (PONs)(1), which increase transmission speeds in both downstream and upstream from the prevailing speed of 1 Gbps to 10 Gbps, are now starting to be deployed commercially, there are constraints in using them for optical aggregation networks because the number of optical network terminals (ONTs) for the most commonly used PON is typically limited to 32 connections and its transmission distance is also limited around 20 km. To address these constraints, especially in upstream bursts(2), Fujitsu and Fujitsu Laboratories have developed a burst-mode optical amplifier technology with a semiconductor optical amplifier (SOA)(3), an integrated SOA-array(4) module fabrication technology, and an SOA chip fabrication technology enabling uncooled operation. These three technologies, used together, make it possible to quadruple the splitting number in an optical access system and double the transmission distance between the central office equipment and the terminal equipment. This makes it possible for a next-generation optical access system to be used as an optical aggregation network at low cost and with low power consumption requirements, paving the way for cloud infrastructure. The research results achieved by the Commissioned Research of National Institute of Information and Communications Technology (NICT) have been applied to portion of this work. Details of these technologies were presented at the 37th European Conference and Exhibition on Optical Communication Conference (ECOC2011), held in Geneva, Switzerland from September 18 to 22. As we move into the era of cloud computing, in which a large volume of terminal equipment and devices are connected to the network, technologies that allow for low-cost, low-power, and long-distance connections are becoming indispensable. With the increase in traffic over the Internet, the increasing amount of electrical power consumed by routers and other networking hardware is becoming a pressing issue. The use of optical aggregation networks has been proposed as one way of reducing power requirements. In an optical aggregation network, many small routers that make up today's network could be consolidated into a relatively few large routers, which would connect to many users over optical fibers. This holds the potential to greatly reduce power consumption. While PONs, which increase transmission speeds tenfold to 10 Gbps, from today's prevailing level of 1 Gbps, are coming into commercial use, there are obstacles in applying them to optical aggregation networks in that the most commonly used PON is typically limited to 32 connections and its transmission distance is limited around 20 km. These figures need to be improved in order for the technology to serve a sharply increasing number of users at low cost. The three technologies that Fujitsu and Fujitsu Laboratories have developed make it possible to implement improved upstream burst transmission characteristics, which needed to expand the scope of optical access systems. This, in turn, quadruples the number of ONTs an optical access system can support, and doubles the transmission distance between the central office's equipment; optical line terminal (OLT) and ONT. The newly developed technologies are as follows. 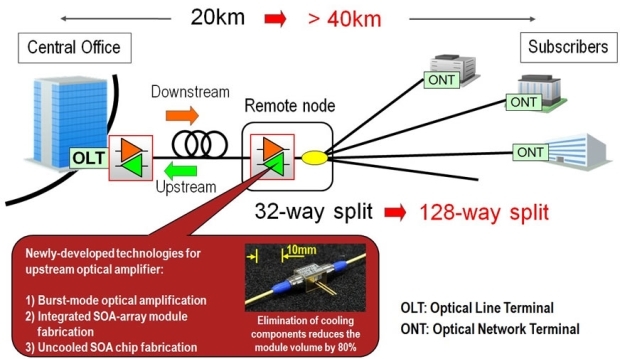 One method that has been considered for increasing the number of ONTs is the installation of optical amplifiers in remote nodes(5) that lie between OLT and ONT, which would compensate for fiber and splitting losses (Figure 1). The technology announced here is for an amplifier that detects an incoming upstream burst and rapidly switches its "off"-state to "on"-state for amplification. Whereas, conventionally, there would be multiple continuous "on"-state optical amplifiers installed, with a proportionate amount of noise making the optical signal-to-noise ration worse, the new technology turns on only the optical amplifier with an incoming upstream burst. This means, for example, that even with four optical amplifiers installed in the remote node (where each optical amplifier equipped to 32-way split), up to 128-way split can be supported with the same amount of the optical signal-to-noise ratio as 32 (Figure 2). In an industry first, integrated four semiconductor optical amplifiers are fabricated into a single module (Photograph in Fig. 2). The Newly-developed optical coupling scheme simultaneously couples four SOAs with four single mode fibers with high efficiency, which reduces cost and footprint per piece. An aluminum composite material is deployed in the active layer of the semiconductor optical amplifier to obtain high gain, even at high temperatures, eliminating the temperature control of SOA (Photograph in Fig. 1). This dramatically contributes to the reduction of the module volume to one-fifth and one-sixth the power compared with a conventional cooled SOA module. It operates at temperatures of up to 85°C, so it can be installed outdoors on utility poles or in street gutters, allowing for remote nodes that need to operate under harsh conditions. With this technology, a next-generation access system applied to optical aggregation networks can have 128 terminal-equipment connections, four times today's splitting number, with distances of over 40 km, double today's distance. Figure 2. Optical signal-to-noise ratios (OSNRs) for upstream bursts. 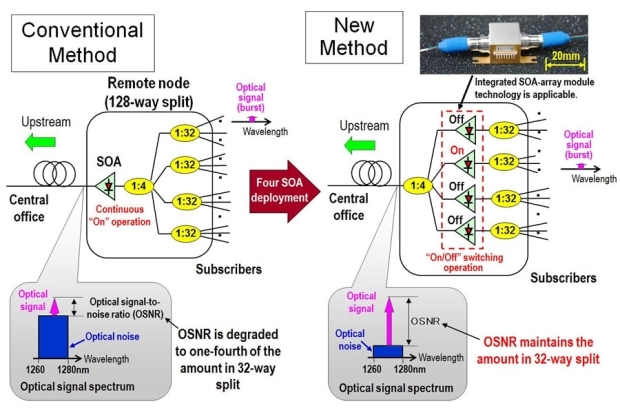 Burst-mode optical amplification before excessive reduction of optical signals is essential to keep high OSNR. Deployment of 4 SOA in remote node allows to maintain OSNR in 32-way split even in 128-way split. Fujitsu will continue with research and development into optical aggregation networks using this technology, and plans to extend it to cloud networks to accommodate traffic more efficiently. Used in optical subscriber networks and mobile backhauls. PONs have one-to-many connections between the central-office transmission equipment and many terminal equipments, and each terminal equipment sends optical signals to the central office in bursts of 1–100 microseconds during the allowed time-slot in order not to interfere with each other. Uses compound semiconductors, for which amplification performance varies greatly with temperature, so that cooling components are mounted within the module, and SOAs are used under temperature control. An SOA chip that integrates multiple SOAs into an array. A node comprising an optical coupler splitting/multiplexing signals and an optical amplifier, placed between a central office and terminal equipments.